Du, a UAE-based telecom provider from Emirates Integrated Telecommunications Company (EITC), has launched an intelligent connectivity solution in collaboration with Cisco at the ongoing Gitex Technology Week in Dubai, UAE. The launch further expands du’s business offerings, to now include SD-WAN Software defined Intelligent Connectivity Service (SD-WAN) provides business customers with a clear visibility of their WAN, allowing them to dynamically optimize traffic and bandwidth to match business and seasonality demands while balancing performance, operational simplicity and cost. The announcement comes just months after the two companies announced a joint white paper outlining du’s technology roadmap for digital transformation. The new services launch further strengthens du’s strategic collaboration with Cisco and marks a key milestone in du’s execution on its 2021 technology vision. “As we drive our digital transformation agenda to spur expansion into new growth areas with ICT solutions, we have been working diligently towards introducing disruptive technologies and services to our customers,” said Farid Faraidooni, deputy CEO – Enterprise Solutions, Emirates Integrated Telecommunications Company. “ICT landscape around the world is witnessing immense disruption, which necessitates transformational change from Service Providers. 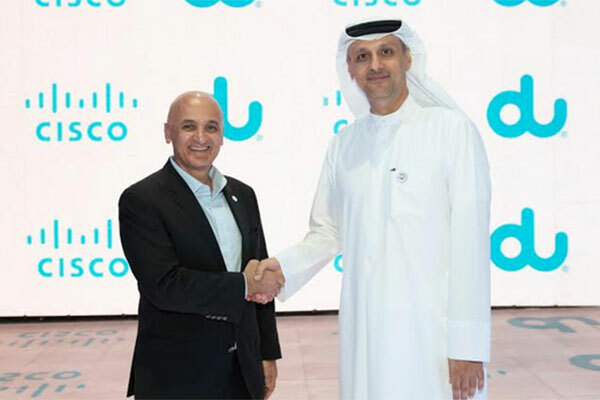 As a technology leader, Cisco is collaborating with du in support of du’s transformation and to help evolve their offerings beyond traditional connectivity services to incorporate a wider gamut of intelligent and cloud managed enterprise offerings," said Ali Amer, managing director, Global Service Provider Sales, Cisco Middle East and Africa.